I feel so Joan today! The color combination and the oxford heels make me want to walk into Sterling Cooper Draper Price and drink some scotch with Don Draper. I've done the yellow and green combination before, but I love the more muted tones of these items. I love how clothes can make you feel so different. Yesterday I felt like really bohemian and today I feel like a 60s office manager. What you wear can transform you and make you feel beautiful on the outside when you feel different on the inside. It's the perfect pick me up in the morning- no coffee needed! I love the mix of the yellow and green tones, especially with the Steve Madden shoes! And I know exactly what you mean with how clothes make you feel and look different - one day I'm an edgy rocker and the next I'm a girly girl. It's so fun to experiment with different clothing and styles. That's what makes fashion so amazing! I love Joanie. She's the best. So are you! 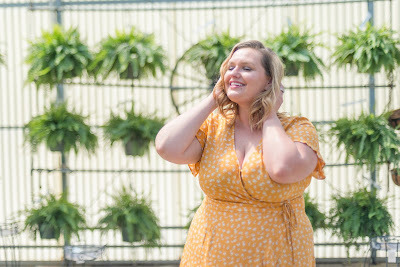 I fully agree with you re: clothes and how it can transform you and how you feel. And you ARE tres Joan! Love it! I am in love with that skirt and those shoes. I actually have some similar ones in black. OMG Before you said/wrote anything I was just thinking that you look like Joan! Spot on. She is the sexiest, the sassiest, the chicest. And now, so are you! P.S. : A gold pen pendant is all that's missing. I like the backdrop color you chose with the colors in your outfit. OMG you're TOTALLY channeling Joan. I love it! You ARE so Joan today! I can't imagine a more perfect color combo to go with your hair. And what a stellar skirt! 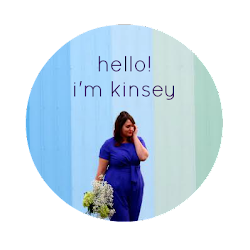 Kinsey, you've been rocking the coolest color combos on this planet. I'm totally digging the yellow and green in this outfit! And those shoes are precious! I said it before and I will say it again - you've got perfect colours in your wardrobe babe! Love that skirt! Those muted colors are great! I guess everyone watches Madmen except me. Now if they make a cartoon version I may watch it. Not my genre of choice, it's what the TV hogs watch. I love the color combo in this outfit and those shoes are really cute!